Although the industry is dominated by wristwatches to a large extent nowadays, it is still possible to see desk and wall clock models with creative designs from different brands. 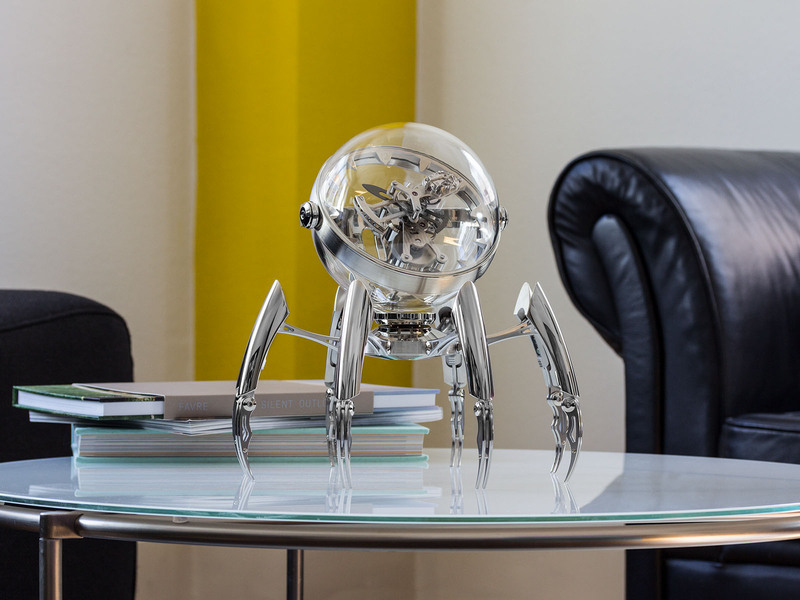 Octopod, introduced by MB&F (Maximilian Büsser & Friends), fits right in to this group. 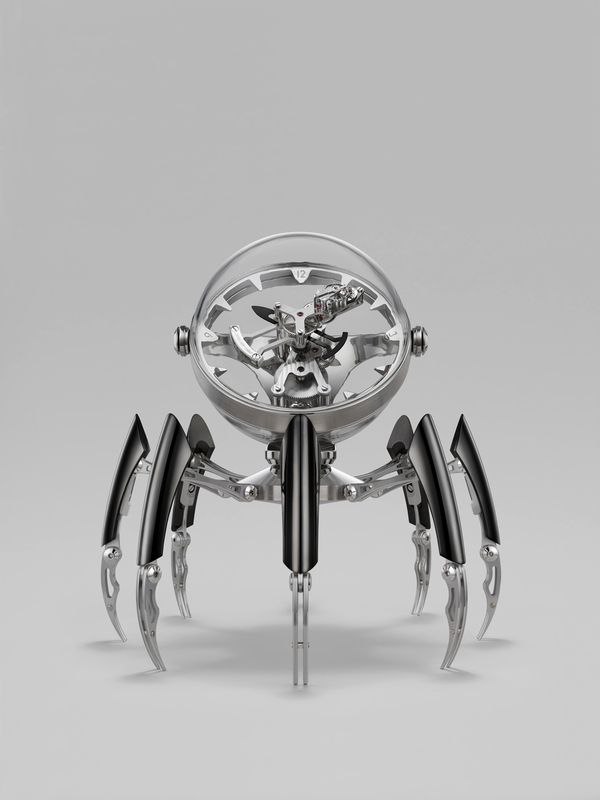 The model bears the MB&F brand name. However, behind this new creation is the great support of the master clockmaker L'Epée, which has long been cooperating with MB&F. L'Epée, one of the distinguished names of the industry, manufactures high-end clocks for over 175 years. At the same time, they have their signature on sci-fi inspired MB&F models such as Starfleet Machine and Destination Moon. 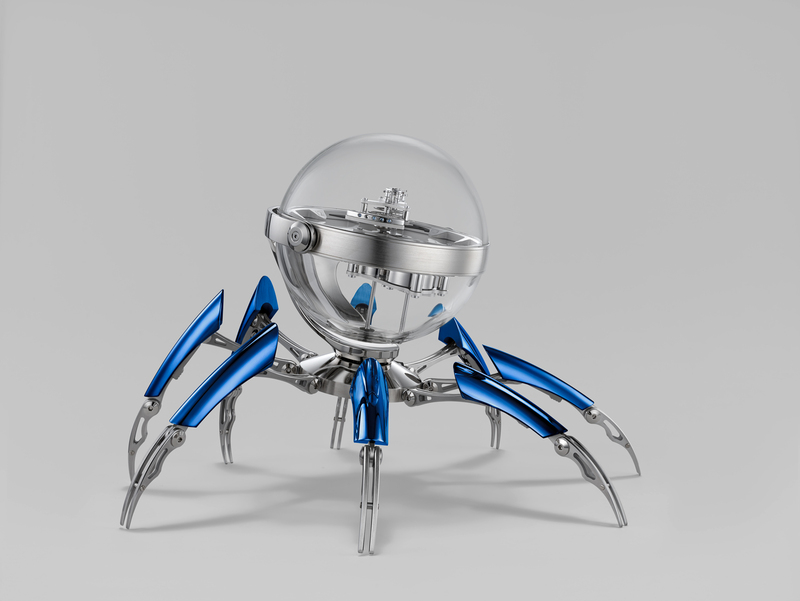 Meanwhile, the first model of the MB&F inspired by sea life is not the Octopod. They also have the HM7 Aquapod model, which was inspired by the jellyfish that stung Maximilian Büsser's wife. Well, we are not wrong to say that Octopod is inspired by many different subjects related to the sea as we find many different elements from marine life to precision instruments used for navigation. 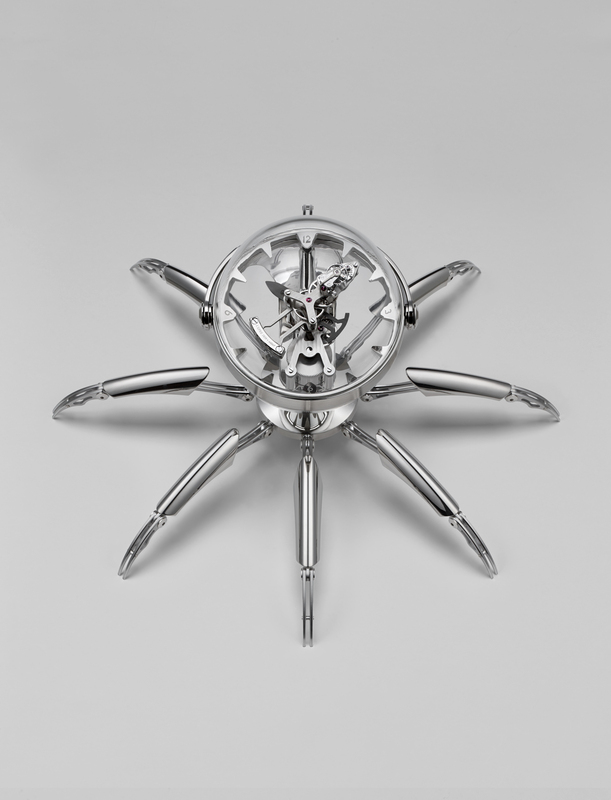 The model has eight legs made of palladium plated brass. The legs can be adjusted to different heights individually and they can go up to 28cm in maximum height position. The legs carry a glass head placed inside a gimbal type balancer. The glass ball is composed of a pair of hemispheres made of poly-carbonate. In the center of those hemispheres is a transparent base-plate coated with a special type of film on both sides for anti-reflection, in order to provide the floating effect of the movement. This engineering marvel’s escapement is designed to complete a full turn in 60 minutes. Being assigned for the minute hand task as well, the escapement has the balance wheel mounted on its tip -evoking the Ulysse Nardin Freak model. Considering the movement’s ability for rotating both horizontally and vertically, the escapement works like a Tourbillon. 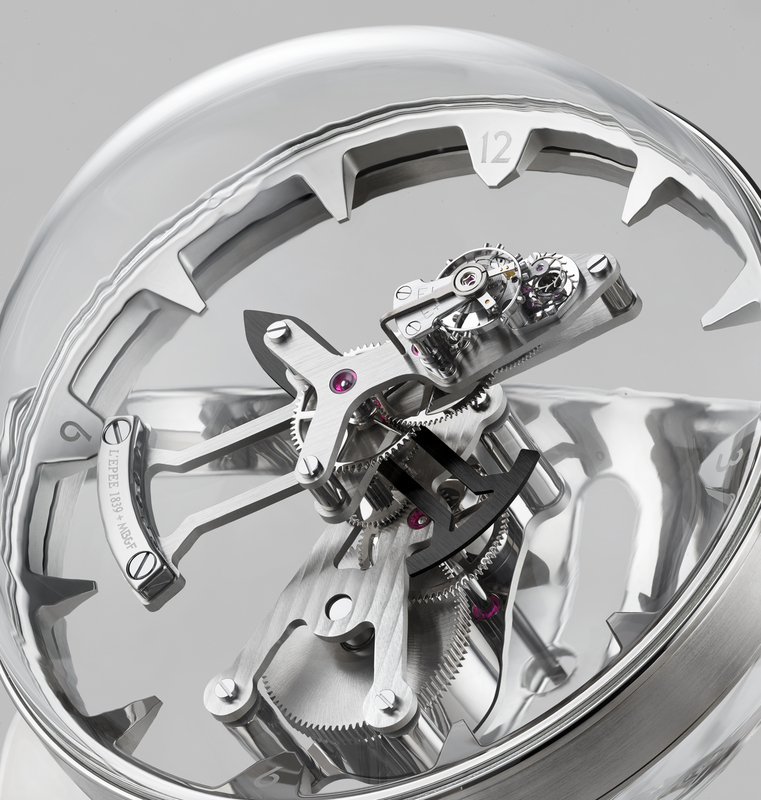 Due to the movement’s unique construction, the adjustment of the escapement’s counterweights becomes a difficult task. In order to provide undisturbed oscillation for the escapement, a pair of screws and five adjusters are used. At this point, the timing accuracy of the mechanism has been moved to the highest possible level. The required energy is provided by a huge, single barrel that is capable of offering 8 days power reserve when fully wound. Octopod is offered in three versions as black PVD, blue PVD and Palladium. Each version is limited to 50 units only with a MSRP of CHF 35,000.